The client intended a website to provide an internet accessible garage sale/ Yard Sale system where people can search the garage sale in their area. The site should provide various options to buyers like buyer can view his search result on the map, select the various option of traveling form start location of to end point. Buyer should be able to see the driving direction and also get the weather info by giving the required zip code. The site should also provide seller to update his information regarding the yard sale, the information includes uploading the items photographs, adding the description of the yards sale. STPL has experience in working on applications where Mapping functionalities can be deployed. Integrating the application into direct data feeds from the News Papers infrastructure is another strength which is a special skill set of STPL. This site provides with listings of garage sales near the buyer's Local area and also generates a street map one can easily follow directly to the pre-chosen sale locations. Sellers can list their sale through their local newspaper so that it can be seen by everyone reading their newspaper or viewed by anyone on the Internet. Buyer (Search for a Sale): Buyers can search the website for Garage Sales by items they have most interest in buying or by their designed mileage radius they wish to travel within a day. The Yard Sale buyer can knowledgeably pre-select Yard Sales by searching for specific items being offered and selecting only the sales they are most interested in. 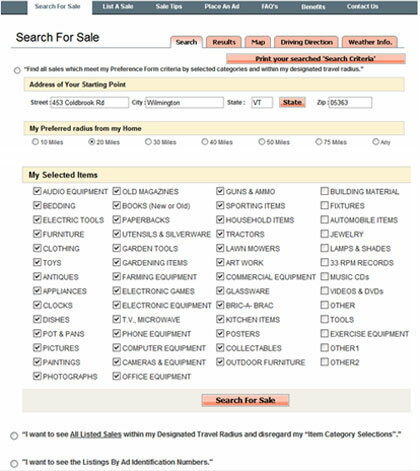 Seller (List a sale): Seller can list their sales by first placing the Yard Sale printed classified ad in the local newspapers’ classified section and choose the option for a nominal extra charge to derive the ultimate exposure for the sale. Developing this Real-estate site was challenging and innovative. The most challenging feature in this site was integrating Google API with the site's search. The map will provide door to door map. 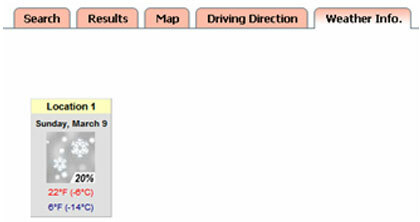 The site was also supposed to provide driving directions to the user. Another challenging feature in this site was providing Weather forecast for sale destinations. STPL has the expertise and innovative skills in bringing up the best in the Real-estate. The development team at STPL integrated the Google API with its search feature and advanced search. This was done in an innovative way that the results from the search are passed to the Google API and are reflected in the map. 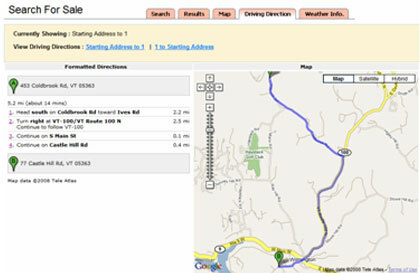 The site also provides driving directions through Google services. Weather information is also provided; this is achieved by integrating the site to another service provider.